One way or another, the road sides in France are being subjected to a concerted clean-up effort though fears about the end of tree-lined avenues are probably overstated. Also, fears for Montenegro’s ‘most important road’ as the country prepares for its first ever motorway. MEPs vote for highly controversial cleaner, safer trucks. Bosnia puts an end date on Corridor 5c. UK freight truck exports have finally recovered from the Credit Crunch. Overdue, ambitious and controversial plans to clean up the road sides. Renaud Donnedieu de Vabres wants to project images of Versailles inside the A1’s Tunnel de Landy at Seine Saint Denis. Photo via Facebook. The emergency €5m voted through parliament last week to clean up around the major roads in Paris has been put to use already. Prime Minister Manuel Valls himself attended the start of clean-up operations yesterday. While the money will be used to clear along all the major roads in the Ile de France capital region, the focus is in the north, particularly the A1 between Charles de Gaulle airport and the city centre what, for most visitors, is the gateway to Paris. Valls wants to rid the road sides of years of accumulated rubbish, and the remains of Roma camps cleared last year, ahead of the Paris Air Show in June in the COP21 Paris climate conference in December. At the same time, a former culture minister is trying to revive his own ambitious plans to spruce up the A1 in a speech today at the PM’s official residence L’Hotel Matignon. 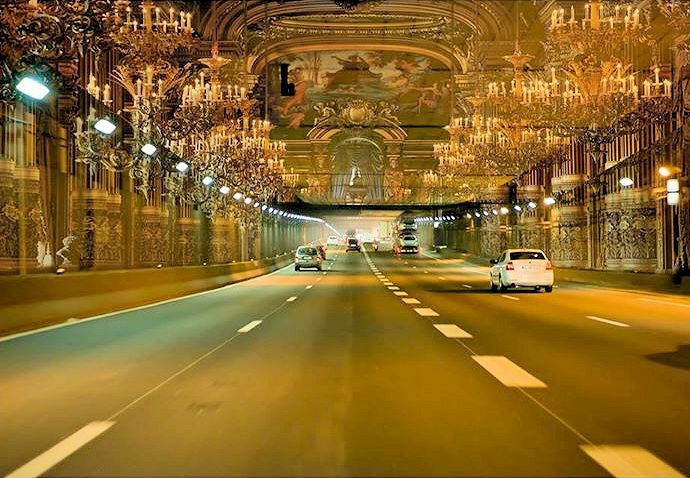 Renaud Donnedieu de Vabres wants to landscape the A1’s verges, erect video screens along the road and – most striking of all – project images of Versailles inside the Tunnel de Landy at Seine Saint Denis. The plan has been dismissed as fanciful by many but Vabre’s timing could hardly be better. Meanwhile, environmental campaigners are upset over new plans to chop down France’s characteristic tree-lined avenues. As predicted, after road deaths rose last year councils have been told to fell trees at accident hotspots but ASPPAR – the Association for the Protection for Roadside Trees – say the trees are safe and may even help motorists by giving advance warning about bends according to the Independent. However, Chantal Perrichon from LCVR – the League Against Violence on the Roads – tells the paper trees are involved in one in eight of all fatal traffic accidents. 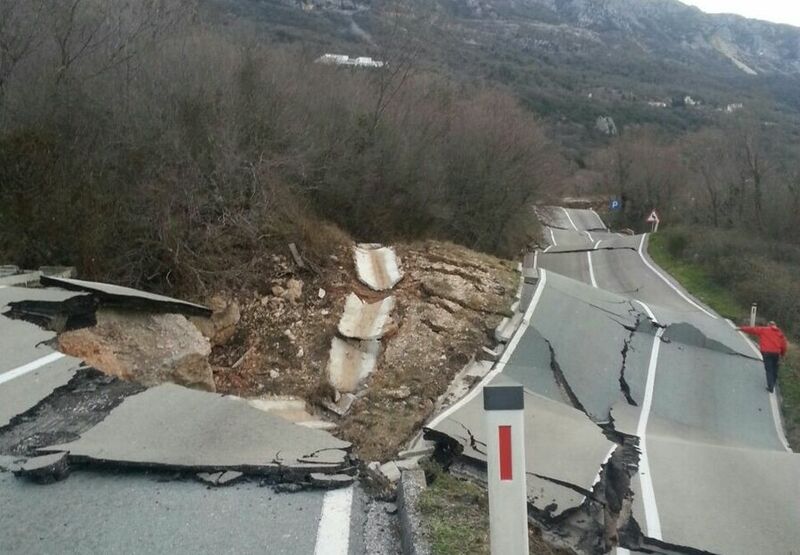 A road called ‘one of the most important in Montenegro’ – on the quickest route between capital Podgorica and the coast at Budva – is being washed away by a landslide reports Independent Balkan News Agency. The Western Balkans has suffered several episodes of severest winter weather, most recently heavy rain last week. With the landslide still active it is not certain the road will be in action for the summer. The detour, on a lower grade road, is 50km longer. Meanwhile, recruitment has started ahead of the country’s first motorway project, 170km from coastal resort Bar to Boljare on the Serbian border. The first shovelling should start in April. Photo via Twitter. roundup: TRUCK DESIGN. The European Parliament backed controversial new safer and more eco-friendly lorry design rules today to be phased in between 2018-22. Lobbying from manufacturers is widely blamed for delaying the new regulations which the Commission had wanted for 2017 (see more). Rounded cabs give a wider field of view for the driver, better aerodynamics improve fuel consumption while hybrid or alternative propulsion systems are given a one ton allowance (though payloads will not change). The Parliament had previously rejected Commission proposals to allow so-called megatrucks, 25.25m lorries with 60 ton payloads, leaving it Member States to decide within national borders. BOSNIA. Corridor 5c, the north-south motorway, will be finished by 2020 the director of highways Ensad Karic told the Sarajevo Times today. Construction has been slow but impressively steady since the US Wikileaks cable described 5c as ‘The Road Not Travelled’ in 2011. The first border section opened last September in the south, to the Catholic shrine Medjugorje. Thirty five percent, or 102km, is currently in operation, mainly between Zenica and Sarajevo in central Bosnia with sections around Zenica and down towards Mostar underway. FREIGHT. The number of ‘road goods vehicles’ travelling to Europe from the UK increased by 9% last year to 2.9m, beating the previous high set before the credit, in 2007, by 1% reports the Department for Transport (via the Road Haulage Association). Just under 20% of the 2.2m powered vehicles were UK-registered.